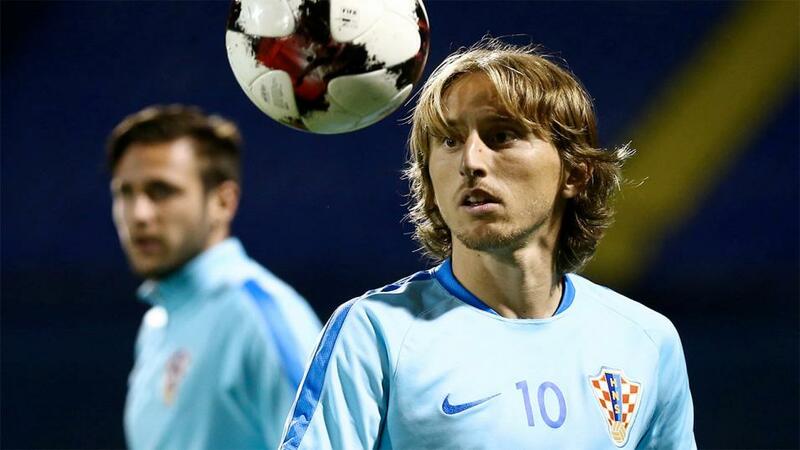 Luka Modric is the leader of this dangerous Croatian side. There's a surprising amount at stake in this match and there are two decent same game multi-bets to put our money on before England and Croatia kick-off at Sunday lunchtime. "That of course includes Raheem Sterling, who was unused sub against the USA. After a horrible run without scoring for his country, he got not one but two in that famous win in Spain. Those were two of the nine he’s scored this season for club and country from just 17 appearances and he’s been looking in brilliant form, arguably the most influential of all of City’s attacking players." Let's start out by reminding ourselves of the current situation in Group A4 ahead of this match. A win for England will see them top the group by leap-frogging Spain after Croatia's late winner over Luis Enrique's side on Thursday night, meaning it's all to play for. A 0-0 draw would mean it's as you were with Spain winning the group, England finishing second and Croatia being relegated to the B Groups. A score draw would see Croatia finishing ahead of England in second-place with Spain winning it and England being relegated because it's the head-to-head record that's the decider when teams are level and in Croatia it ended 0-0 between these two; away goals would come into play. A Croatian win would see them win the group and book their place in the semis with Spain finishing as runners-up and England dropping down a division. Clear as mud? Let's choose some same game multi-bets. There was a same game multi-bet coming in at 9.0 on Thursday in the Croatia v Spain game. Croatia have always been a somewhat funny sort of side. They remind me a bit of Pakistan in international cricket in that they're uncomfortable turning up as favourites and being expected to win and would much prefer to have the underdog tag and spring a surprise when little is expected of them. Good (and very relevant) examples of that are the way they knocked England out at the World Cup, that famous 3-2 win back in 2007 that stopped England qualifying for Euro 2008 and of course just a couple of days ago, that 3-2 win over Spain in this very competition. Yes, there will be a little fatigue after that energy-sapping victory over Luis Enrique's men where Luka Modric was once again excellent, while England had a pretty straightforward match against a poor USA side, with the added distraction of Wayne Rooney's farewell appearance to contend with. Assuming they're not too tired, it's easy to argue that Croatia's preparations were the more useful ones ahead of this big game. All in all, those are good reasons to think England are worth opposing at odds-on (20/23). Another is that with just two defeats in their last 13 matches in all competitions, these Croatian boys are clearly a hard nut to crack. And we should really see both teams score here. Of course, they drew 0-0 when playing in Croatia a few weeks ago but that was a rare occurrence of this fixture not producing goals. Before that they ended 1-1 (after 90 minutes at the World Cup, Croatia scored the winner in extra-time), 5-1 and 4-1 to England, 3-2 for Croatia, 2-0 to Croatia and 4-2 to England back at Euro 2004. Assuming it doesn't stay 0-0 for too long, which would be a bad result for both teams anyway, whoever scores first can expect a backlash from the other side who will have no choice but to chase the game. We really should see both teams get a goal here, an 8/11 shot. The double comes to 2.89. It will take a little bit of detective work to figure out who will start for England but the rule of thumb is that those who played on Thursday from the start probably won't be on the team sheet and the big name guys who didn't, probably will be. That of course includes Raheem Sterling, who was unused sub against the USA. After a horrible run without scoring for his country, he got not one but two in that famous win in Spain. Those were two of the nine he's scored this season for club and country from just 17 appearances and he's been looking in brilliant form, arguably the most influential of all of City's attacking players. I also wouldn't underestimate what a difference it might make now that he's got the monkey off his back in an England shirt and all things considered, is a pretty good price at 2/1 to score anytime. I don't normally like to put all my eggs in one basket and in this case I'm slightly doing so by taking the view that there will definitely be goals in the game (because the first same-game multi also gambled on that) but I really think there will be. But rather than being dependent on just the one scenario where that could happen, it's best to hedge our bets and go with a different ploy. A goal scored in both halves is 4/6. Ideally of course we'd want an England goal in one half, a Croatia goal in the other and no England win, which would make the first-game multi-bet a winner. But assuming Sterling gets one, I'll happily also take the same team in scoring in both halves here. This one comes to 4.19.